First up is probably my favourite châteaux - Chenonceau. 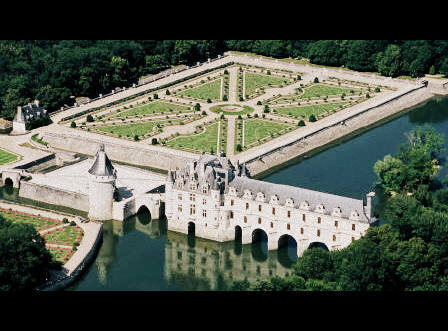 This is one of the most visited castles in the Loire. It has beautiful architecture and spans the River Cher. This is the gallery, built while the châteaux was owned by Catherine de Medici. This gallery spans the river. It has the most beautiful floor and an interesting history. During World War I the gallery was used as a hospital ward; during World War Two it was a means of escaping from the Nazi occupied zone on one side of the River Cher to the "free" zone on the opposite bank. You can walk to the other side of the River Cher (through the gallery) and have lovely uninterrupted views and tourist free time on the opposite bank. The kitchens of Chenonceau are famous. A "must see"
Second on my list of favourites is Chambord. A seriously grand châteaux. This is where Phil gave me my engagement ring. A double helix spiral stairwell. An engineering feat. Incredible décor - look at me trying sit all ladylike and posh! Here's where we'd actually gotten engaged almost a year before. We had a weekend in Paris and Phil proposed on the bridge over looking the back of Notre Dame. Just perfect. But we were Aussies living in London with no money for a ring so we waited until we'd earned our British pounds. This was when the Aussie dollar was 3 to a pound. It was no good to bring money over from home. We also visited Château d'Azay-le-Rideau where this photo below is taken. Ha ha. But it's one of the few photos I have of us together from that weekend so worthwhile sharing. And also Cheverny, which has the fame of being the chateaux that Marlinspike Hall in Tintin is based on. Do you recognise it? On this weekend we didn't make it to Villandry, but the gardens there are spectacular. I'll have to dig out my old photos from 1995 when I was there and share them. ...and to finish off this tour of the Loire is some French champagne - served as a kir royale! Yum. the playground of the seriously rich! hi Mirkka -thanks for such a lovely comment. I'm very happy with the balance in my life! To be an exchange student in europe would be a dream! WOW, really beautiful photos!! The one with the bridge reflected in the water is incredible!!! I'm so glad you gave me the link to this post, thank you! thanks Tracey. It's a beautiful place isn't it. I'll send you an email about Brugges also. it's lovely and you can do a bike riding tour also. Aww, cool photos, what a lovely spot to get engaged! I have never been to the UK or Europe, maybe one day...Geoff did the obligatory OE and saw lots of the world before I met him. He proposed to me on our first anniversary of going out together, on the top of Fox Glacier after a helicopter ride up there, a total surprise to me, and he even had the ring he had chosen himself (he picked the perfect one). All my photos of the event are old fashioned ones, and I have no digital copies, must work out how to scan them one day! Been in the new place two weeks now, and starting to feel a little bit settled, albeit paint-fume and sanding-dust deprived, lol! hi Karen - thanks! glad to hear you are settling into your new place. your engagement sounds great. we were meant to hike Fox Glacier on our honeymoon but i ended up in hospital so phil went by himself (although he didnt know i was in hospital) long story . not so much fun on a honeymoom!